Until recently, Packard Bell was the consumer arm of NEC Computers. However, it now stands as an independent company and the EasyNote MV51-120 (£649 inc. VAT) stands out as a cost-effective solution. The advantage with Packard Bell machines is you can buy them on the high street, so you can check out how it handles before you buy. To this end, you'll find the chassis, which is made from tough plastic, is robust and solid. While there was a degree of fan activity, the system never grew noticeably warm. We also found this a reasonably quiet laptop, ideal for use in either an office or home environment. The MV51 has a good-looking design that is dominated by the stylish touchpad and the 15.4-inch Super-TFT panel. The screen was bright and while the resolution of 1280 x 800 pixels is standard for such a panel, you'll find images are sharp and clear. Graphics come courtesy of the nVidia GeForce Go 6100, the company's first integrated graphics chip for laptops and, as such, competes against Intel's 950GMA and the ATi Mobility Radeon 200M. In test we found it achieved a 3DMark 2003 score of 1151, which is in keeping with integrated solutions, even though it can draw up to 128MB of system memory. The choice of chipset has been dictated by the use of AMD's dual-core platform; in this instance, the Turion 64 X2 TL-52, which runs at 1.6GHz. With two cores, you'll find you'll be able to run multiple applications without an obvious slowing down in performance. Supported by 1024MB of DDR2 memory and fitted with a Hitachi 100GB hard drive, this is an impressive specification for the price. While this wasn't reflected in the MobileMark 2005 score of 181, we found it a responsive system. Where the MV51 proved less impressive was with its navigation. The keyboard is of a good size and the keys well spaced with plenty of travel. That said, we found we needed to strike the keys firmly for them to register. The touchpad is large and responsive, but the mouse keys proved a little sluggish. With an overall weight of 2.7kg, there is a degree of portability to be had here, and with a battery life, under test, of 182 minutes, the MV51 lived up to minimum expectations, but we'd like to have seen a little more battery life from the machine. 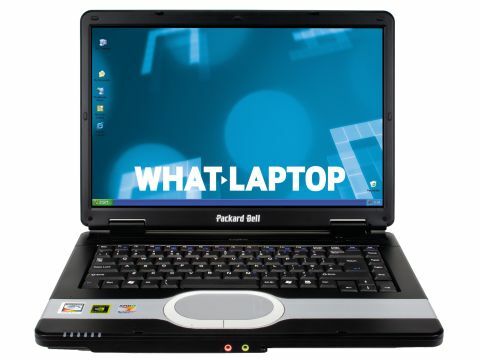 Packard Bell offers a standard one- year collect and return service on its laptops, which covers parts and labour. As its machines are sold through the retail channel, you'll find upgrade options will be handled by the store where it was bought, so prices and options are likely to vary.